Fig jam is a taste that brings me back to summer in Greece with each bite. A delicious, sweet flavor combination of apples and pear with it’s own special citrussy twist – fig jam is just fantastic! 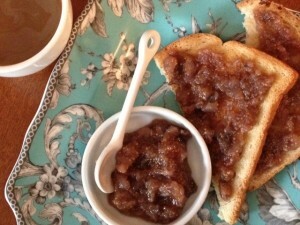 Spread on toast, this jam is one of my favorite quick breakfasts. It’s also a simple and lovely desert served in a filo tart shell. Once you make a batch, you’ll find so many ways to enjoy fig jam – that is if you can stop yourself from eating it right out of the mixing bowl! 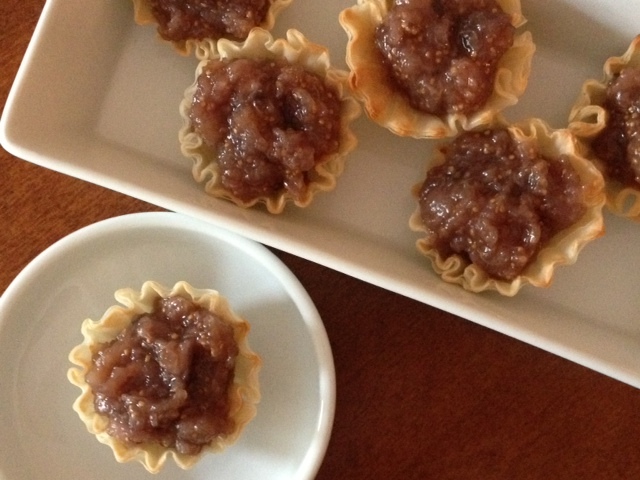 I use the same basic cooking method as for Baked Figs. Then. after baking and cooling, you carefully peel the figs and gently mash the fruit with the syrup from the baking pan until you get to your desired consistency and sweetness. The jam keeps, covered, in the fridge f0r a week to two weeks but honestly it will never stick around that long! 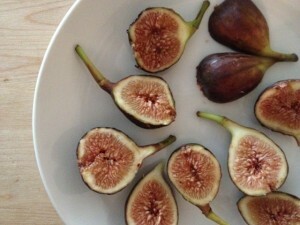 Rinse figs and cut stems off top of each. Score the tops of the fruit with a sharp knife. Place figs skin side down in baking pan. Combine ingredients well and spoon over cut figs. Cover pan tightly with lid or aluminum foil. Bake figs for 20 minutes in 375 degree oven. Remove baked figs from oven and allow to cool until you can comfortably handle them, Then, carefully peel each fig. The skins should come off easily with just a slight rub. Mash the peeled fruit gently in a mixing bowl and add the baking syrup from pan by the teaspoon full until you get to your desired sweetness and jam consistency. Something to remember – this is also a great ways to use figs that are not perfectly ripe. Here in the Northeast US, we sometimes see figs pop up in the grocery over the winter. The fruit is not a beautiful juicy pink as summer time fruit but the figs are still good and fig jam is an excellent way to make good figs great.